She says a lot but you’ve probably never heard a word out of her mouth. 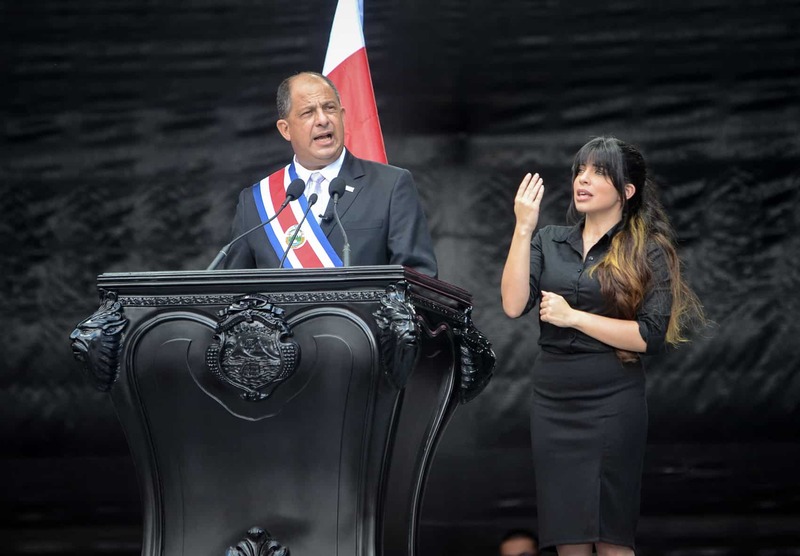 Estefanía Carvajal, a Costa Rican sign language interpreter, was a common sight alongside candidate Luis Guillermo Solís during his successful presidential campaign, and Tuesday the president announced that Carvajal would join his press team at Casa Presidencial. Carvajal overcame any embarrassment about talking about herself in public as she signed the announcement of her employment on stage during a press conference at the presidential offices in Zapote, Tuesday. The president said that Carvajal would interpret alongside him during public speaking events and during activities to discuss disability policy. Casa Presidencial said it was the first time that a Costa Rican administration offered simultaneous sign language interpretation during its events. Solís said that the decision was a “sign of respect and recognition of the rights” of the deaf community here, which numbers some 70,000 Costa Ricans. Casa Presidencial also announced a YouTube channel dedicated to the Tico deaf community. “This is one more expression of our commitment and our respect for the human rights of all populations in our country,” Solís said.